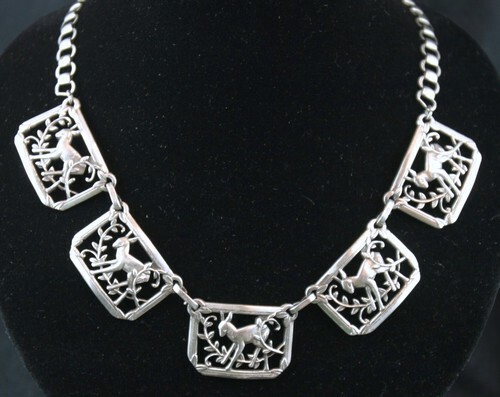 Coro 1940's vintage silver necklace in the "Norseland" series. (Norseland was a brand used by the Coro company for an upscale line of sterling jewelry during the early 1940's.) There are 5 large links (1 inch by 3/4 inch) depicting a deer and vines in a frame. It is marked "Coro" on the back but not marked sterling. There is a heavy chain with flower clasp. It measures about 16 inches.